Rome Cast Aluminum Spindle Pedestal, Antique, 28"
Provide your existing Rome armillary sphere or horizontal sundial a classic display base with this Rome Antique Cast Aluminum Spindle Pedestal. The timeless shape, durable construction, and traditional colors on this item form a wonderful support, easily bringing height to your sundial or armillary. Its 8.25" diameter base ensures stability in your garden, and its rounded body sports a bevy of curves for extra style. This striking shape enhances the classic motif, and its charcoal color with gray and beige hints lends an antique feel. A 6.75" diameter top handily accommodates a Rome armillary sphere or horizontal sundial, and a threaded screw here keeps the adornment secure. For more versatility, the unit can also hold a Rome 8" or 10" diameter gazing globe. The cast aluminum construction provides durability, and the unit rests on a level surface in your landscaping or on your deck. Add height and traditional style to your garden adornments with this Antique Cast Aluminum Spindle Pedestal. 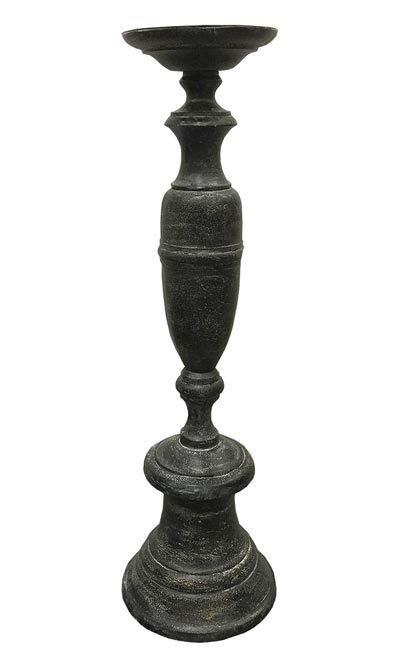 Rome Cast Iron Baluster Pedestal, Antique, 20"
Rome Cast Iron Roman Pedestal, Gray, 28"
Rome Cast Aluminum Spindle Pedestal, Antique, 21.5"
Rome Wrought Iron Hairpin Sundial Pedestal, Black, 24"